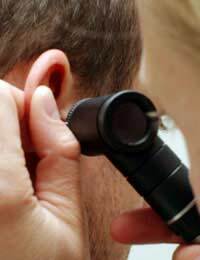 Mastoiditis occurs as an after effect of a prolonged or untreated infection of the middle ear. The infection spreads to the mastoid bone, which is a bony prominence part of the skull located behind and slightly upwards of the ear lobe.This bone is comprised of a honeycomb like structure that contains many spaces, which infection can spread to and grow quite easily. The infection causes deterioration of the bone and can result in an abnormality of its appearance.In modern society with the advent of anti-biotic treatments it is fairly uncommon, as infections of the middle ear can now be treated quite easily if caught early enough; though it affects children more than other age groups. Sufferers may experience discomfort or sometimes severe pain from this infection, particularly as the infection spreads.The ear itself, or the surrounding tissues and anatomy may become red, swollen and tender along with an increase in both localised skin and body temperature.Headaches, discharge from the ear and hearing loss is also possible with mastoiditis. With the correct treatment, this condition is not usually seriously harmful long-term, and often anti-biotics will be initially administered directly into the blood stream via an intra-venous injection, as this route allows for the drug to reach its target more quickly and directly than by oral medicines.Following the intra-venous administration, a course of oral tablets is normal, and recipients must ensure they take all of the course in order for the medication to eliminate all traces of the infection; this is important to remember even if the symptoms have cleared up. Those taking anti-biotics should not consume alcohol and should be made aware of the possibility of side effects, though these will subside after the course has finished.Pain relief and the use of paracetamol to reduce fever will often be needed, and these can be taken without prescription. Occasionally surgery may be necessary as a way of inserting tiny tubes into the eardrum to allow for the infectious material to drain away, or as a method of removing permanently damaged bone.To allow for drainage of the infection, try sleeping on the affected side to permit gravity a chance to aid recovery; it may be advisable to use an old pillowcase or covering the pillow with a towel to soak up any discharge.Do not pack the ear with cotton wool or any other substance unless advised by a professional as this can trap the infection in the ear and even risk pushing it deeper into the tissues. If mastoiditis remains untreated, long-term hearing loss is a possibility along with the risk of the infection spreading to other parts of the body, including the brain, with the chance of causing abscesses or even meningitis. Mastoiditis is now quite an uncommon disorder, and is usually seen in those who do not take the appropriate treatment recommendations when suffering from an infection of the middle ear. With the use of anti-biotics, this condition should resolve without causing and long term detrimental effects. After 24 weeks of constant pain behindear, and repeated requests for head scan (all ignored by GP`s and local hospital) finally had 2 MRI`s, diagnosis: Possible Mastoiditis. Given ear drops, but no antibiotics. Now because of deafness in affected ear, am finally seeing ENT Specialist. Have been subjected to chronic pain far too long, I hope because of late diagnosis all will be well at last.